In My Head Studios: Borrow My Pen? A few weeks ago Erik and I were running errands and shopping down around our old haunt neighborhood of Monroe Avenue and Oxford Square. One of my all time favorite shops has been there for ages. It's called Archimage. They sell all sorts of silly things, fun things, Asian pottery, drums, incense, jewelry, wood knickknacks, little Buddhas, stationery, and clothing. Much of my money could happily be spent here and has been over the last 20 years. 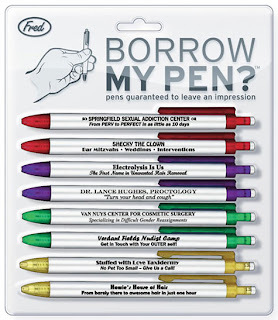 So feel free to lend these pens out and watch your friends faces when they read them! No one will be asking to borrow your pen anymore! Did You Say “Earthquake”? Huh?